Six months after Hurricane Katrina, where are New Orleans's neurologists? While figures are not yet available, it seems that many practitioners have left town, some for good. And although starting anew is always hard, it seems that leaving New Orleans – often affectionately dubbed “The Big Easy” – is particularly difficult. Several neurologists whose lives were shattered by the storm told Neurology Today that moving was a tough decision – and one they didn't make easily. In the aftermath of Katrina, neurologist A. J. Friedman, MD, lost his entire first floor office – all of its medical records, computers, accounts receivables, equipment, and financial records. More important, he pointed out, his patients have left town. In the heavily struck mid-city area of New Orleans where he practiced, there still is a long way to go before life will be normal again. So after taking stock of his options, Dr. Friedman decided to take a new job in Waycross, GA. At the age of 59, he is starting all over again, in a town where he knows no one. Michael T. Happel, MD, considers himself one of the fortunate ones. His main neurology practice office in New Orleans East was destroyed, but his home made it through. Another neurologist who did lose her house, but not her practice, offered to share her office in Metairie so he can finally see patients again. That's not to say that the going was easy. “We lost our entire referral network and about 70 percent of our patients,” said Dr. Happel, who was unable to get into his office until five weeks after the building was flooded. There is still no power or elevator service; to reach salvageable supplies and the patient charts, he has to walk up ten flights of stairs. He can't get help due to the skyrocketing cost of labor, and has still not seen a penny from his property or business interruption insurance despite enormous losses including $10,000 worth of botulinum toxin-1A (Botox). Costs have gone up too – supplies, hiring new employees, and even ordering lunch for the office. Just driving to work has been challenging due to tremendous traffic, long lines for gas, and dangerous construction debris. In a span of a few weeks, he had to have three tires patched and two replaced. Dr. Happel and his partners have had substantial delays in payments, even from pre-Katrina services, and he suspects that insurance companies are stalling. Financial worries and the pressures of living under trying conditions have been taking a toll on everyone. A dermatologist and a pediatrician committed suicide, as did an alarmingly large number of other professionals, according to a coroner's report of non-Katrina deaths as of Jan. 26. Statisticians have estimated that the rate is twice as great as national or local averages and is likely to increase. “In addition to the enormous stresses of living under these conditions, there is the daily angst of seeing New Orleans, once so beautiful, ruined,” said Dr. Happel. It was not only practicing neurologists who struggled with the issue of starting over, but residents and fellows as well. Alicia Cabrera, MD, was so delighted to be training in New Orleans at Louisiana State University (LSU) that she had bought a new home a few months before Katrina hit. But when the levees broke, her house sustained such severe flood damage that it was uninhabitable. There were no rentals in New Orleans and at one point, Dr. Cabrera and her family were forced to sleep in their car. Her mortgage forgiveness was reaching its time limit too and insurance relief did not appear to be coming any time soon. In the first few weeks, LSU was unable to inform its residents of where they would be training, assure its faculty of job security, or anyone of housing. Facing so much uncertainty while responsible for two elderly parents and a three year-old child, Dr. Cabrera made the painful decision to move. Her cousin, a surgical resident at Duke, initiated inquiries on her behalf and when she was accepted, she and her family moved to Durham, NC. But relocating has been rough, said Dr. Cabrera, who had completed a neurology residency in Cuba and has moved three times since then in order to re-credential in the United States. “People are really nice, but it is hard to start all over again from scratch,” she admitted. In fact, although she was a PGY-3 resident at LSU, she spent the first three months at Duke on basic floor rotations along with first year residents in order to become familiar with the hospital's routines. Some neurologists had to factor in their spouses' circumstances, making the decision to leave doubly difficult. Diana M. Barratt, MD, MPH, previously featured in Neurology Today (Oct. 2005, page 1) could not wait to return to New Orleans after the curfew had lifted. Even though her home had sustained roof damage, the tap water was contaminated, and the stench from the maggot-infested refrigerator was unbearable, she and her husband celebrated their return with wine and chips. But soon her husband, whose Tulane residency program could no longer provide training, found a cardiothoracic surgery fellowship in Miami. So after looking around, Dr. Barratt joined a seven-person private practice. Although she enjoys the change, it has required a huge adjustment. No one yet knows exactly how many physicians have been displaced by the hurricanes that struck the Gulf. Cathy Thompson, Membership Development Manager of the Louisiana State Medical Society, said that the organization has sent e-mails to all members in its electronic database, and has contacted various state and private healthcare organizations in order to try to gather information on members who may have left the region. “There is no way to know the full scope of the problem yet, but I have heard countless personal stories,” she said. “So many physicians had young children that they needed to enroll in schools, or had lost their homes and were unable to find housing, the circumstances made it very difficult to stay in some areas. We are doing everything we can to help our physicians relocate within the state. Only time will tell how many of them will actually stay,” she added. 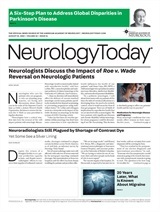 Neurology Today6(5):18,23, March 7, 2006.